File under 99 Cent Deal of the Day. 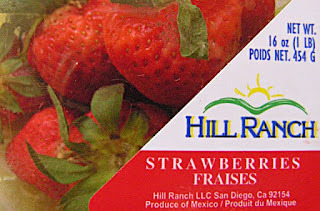 The Chef picked up one pound packaged fresh strawberries at this 99c only Store yesterday. 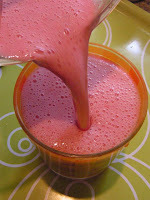 Let's make a 99 cent smoothie. 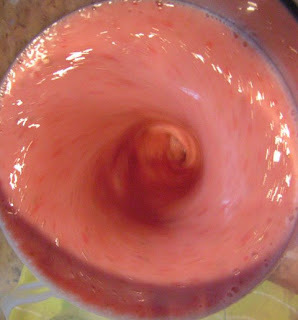 just throw it all in and blend until smooth. Duh! The Poblano chile is large enough to stuff with the Chef's tasty ground turkey mix: just add some raisins, mushrooms and taco seasonings when sauteing ground turkey. For some reason local markets call the Poblano a Pastilla chile. 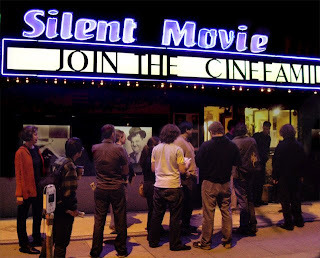 Read about the controversy here on Chowhound. 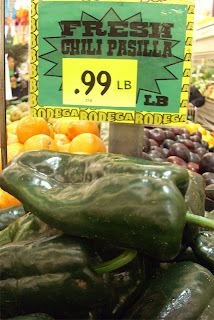 The Poblano chiles are from my local Latin market on Adams Blvd. (with a taco truck out front -- their Pupusas are a tasty distraction.) All other ingredients are from the 99c only Stores; although the Chef has purchased Poblano chiles there -- a Latin market has a better size selection for stuffing. Cooked stuffed Poblano chiles freeze well, too. While sauteing all ingredients over a medium heat, prepare Poblano chiles to stuff by cutting out the tops and removing seeds. 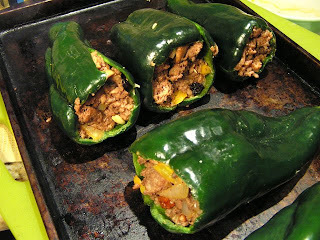 After sauteing ground turkey mix 10 - 15 minutes, stuff chiles; pressing meat tightly into each one. 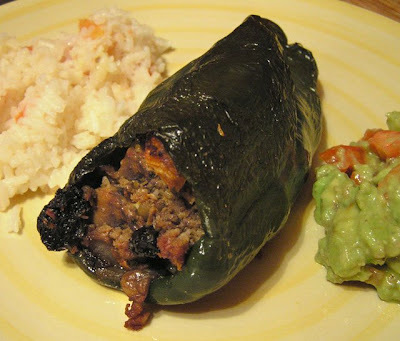 Place stuffed chiles onto a baking pan and cook uncovered about 45 minutes at 350 degrees. The chile will steam, keeping the notoriously dry turkey meat moist. This recipe works well with hollowed out bell peppers and/or large whole tomatoes. A Texan news daily food blog, "Cook's Tour," from the Houston Chronicle (March 17, 2008,) gave the Chef some props, I think? Quote: "Everyone's gotta have a gimmick. The 99-cent chef's is picking the featured ingredients on his recipe blog from the shelves of....ta dum...99 cent stores and other bargain venues. Frightening formula for chicken-liver yakitori included." Now the Chef knows chicken liver is not for everyone, but was the dish "frightening?" - Hhhmmm, absolutely. Well, you can be sure the Chef has many more frighteningly tasty and fun recipes to come! Expect nothing less from The 99 Cent Chef. To get the Chef's blogging interest, just mix irreverence and food. 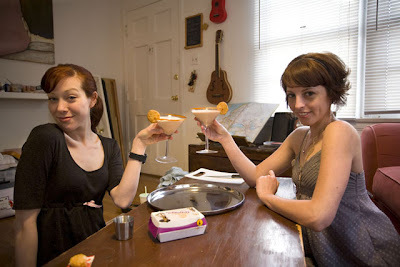 One such attention grabber is a kooky cocktail creation "The McNuggitini" -- found on LA blog "The StateThat I Am In" and created by fellow 99 Cent Store habitue Georgia and her friend Alie. 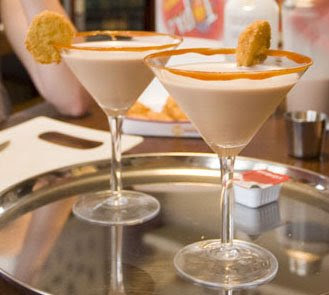 It's a dizzying combo of a McDonalds Chicken McNugget garnishing a White Russian styled Micky D's milkshake, mixed with Absolute Vodka and rimmed with BBQ sauce. By the time you reach the last photo panel you may need a double shot of Pepto Bismol! For a 99 Cent Chef version use a 99 cent airline vodka bottle from your favorite local liquor store; trying to find a 99 cent substitute for McNuggets and Shake would be unthinkable! For the funny photo story and cocktail recipe click here (March 17.) Cheers! 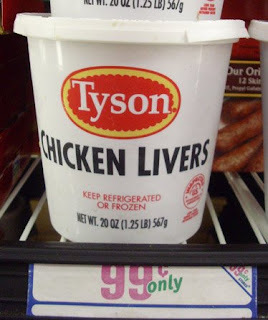 1 1/2 pound frozen containers of Tyson Chicken Livers are showing up at the 99c only Stores. One of the first jobs the Chef had in Hollywood was video editing. The owner was from Japan, so the Chef was lucky to be squired around to every Japanese dining establishment in town; from highend sushi bars to yakitori hideaways in Little Tokyo. Walking into a yakitori room is similar to entering a South Central bbq joint, you are hit with the smell of smoke -- you are in the presence of grill masters. While southern bbq is slow cooked, yakitori is quickly grilled over an open flame. Like a sushi bar, you order individual skewers of chicken offal or meat and vegetables, which quickly arrive lightly charred and perfectly done. In the Chef's version he uses his handy outdoor bbq gas grill. The chicken livers are combined with vegetables like a shish kebab and basted with an oriental sauce. Chopped vegetables: onion, bell pepper, carrots or whatever you have on hand, salt & pepper to taste. 3/4 cup total of oyster sauce, sweet & sour, plum sauce or any combination. 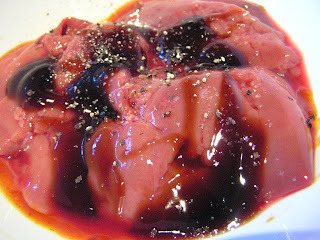 Drain the chicken livers and mix with1/4 cup of your favorite oriental sauce. Chop vegetables in large chunks. Skewer alternately, veggies then chicken livers, making sure both parts of the chicken liver are piecered (the liver is delicate so try not to rip.) Salt and pepper to taste. 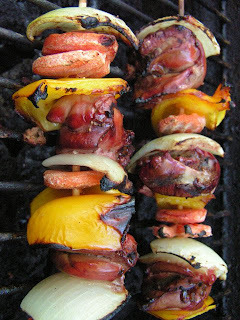 Place skewers on a hot grill. 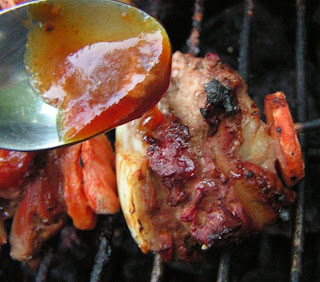 Because the liver flavor is so intense, use plenty of sauce on the liver during cooking. The trickiest part of grilling liver yakitori is it may stick to the grill; use a knife between the grill and liver to gently loosen before turning. Deal of the Day - Beer! 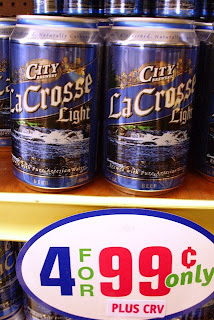 With St. Patrick's day just around the corner (March 17,) the Chef has found the pot of liquid gold at the end of the rainbow: the 99c only Store is selling four (12 ounce) cans of La Crosse Light for 99 cents at this store (for how long?) It's a Wisconson lager that is brewed with pure Artesian water. Yesterday, the Chef picked up a twelver to go with his Patty's Day meal of boiled Yukon gold potatoes. As for the beer, the Chef would rate it as good (?) as PBR (Pabst Blue Ribbon,) another 99c only Store staple that is two for 99 cents. To quote a comment on the Beer Advocate website: "Poured a medium straw hue with a one finger foamy white head. There was decent retention and lacing. The smell featured a light doughy malt and a smattering of flowery hop. The taste was well balanced and consisted of some soft bready malts and light balancing hops. Pleasant residual sweetness. The mouthfeel was toward the fuller side for the style with a touch of creaminess. 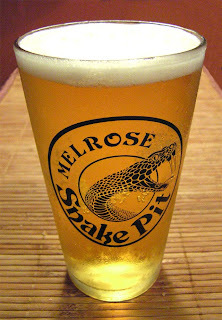 Overall a tasty lager." The Chef could not say it better. To help us when we deal with the fear." See you at The Tam O'Shanter. Note: Not all 99c only Stores sell alcohol and just last week La Crosse was 2 for 99 cents. When the Chef moved into his present abode 4 years ago, the first person who befriended him was his neighbor, Nuno Pinheira, a quick witted raconteur. I've had the privilege to be the recipient of his many amusing anecdotes, bawdy jokes and puns. This is The 99 Cent Chef's Popeye's Fried Chicken "2 Pieces for 99 Cents Tuesday Special" dinner with Nuno. Play it here. The video runs 1 minute 25 seconds. 99 Thanks to my neighbor Pete for his camerawork and to my pal, Nuno Pinheira. To view or embed the Chef's video from youtube click here. * Prices went up in 2016 to $1.79 for 2 pieces of dark meat chicken. 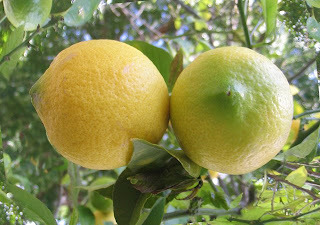 While parking around the corner off Fairfax Avenue, the Chef noticed a lemon tree with its plump, ripened fruit dangling seductively within grasping distance, over the sidewalk. Go ahead and pick away, it is legal, according to the website "Fallen Fruit." It provides city map locations for all sorts of fruit trees that share our public spaces, throughout Los Angeles. 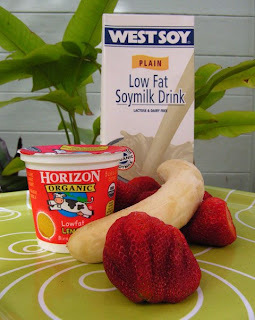 See the website link on the right, under "Blogs for Foodies." 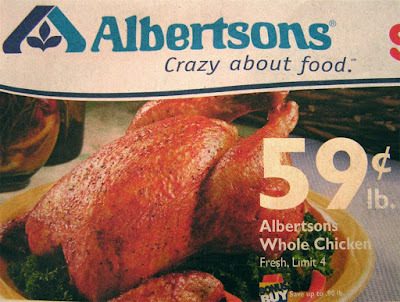 Chicken is the cheapest protein that costs way below 99 cents per pound. You can slide lemon slices into leg quarters or whole chicken breast, too. 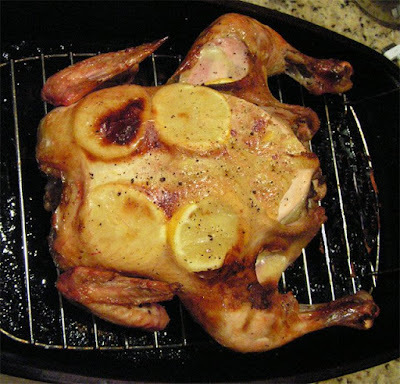 The Chef would like to share a simply delicious recipe based on the fruits of his labor: Russ Meyer Lemon Roasted Chicken. 4 - 5 lemon lemon - slice one lemon to put under the chicken skin. 1 whole chicken - okay to use leg quarters or whole chicken breast. Juice 3-4 lemons and slice one lemon. Loosen skin of breast and thigh meat by inserting your finger under the skin. Be careful not to tear the skin too much. Brush lemon juice over and under the skin. 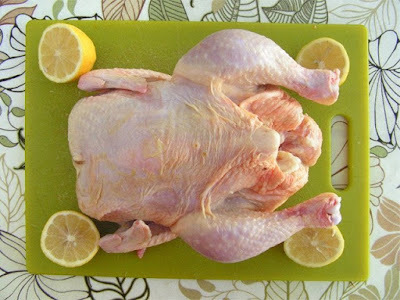 Insert slices of lemon under the skin: four slices for the breast and two slices for each thigh (kind of tricky but work a slice around to the outer thigh and place one slice on the inner thigh.) Salt and pepper to taste. If you have time, let chicken marinate covered, for a few hours in the refrigerator. Bake chicken at 350 degrees, basting with lemon juice a few times, for 1 1/2 to 2 hours; done when juices run clear by piercing the lower thigh meat with a fork. Cover the breast meat with a small piece of foil for the first hour to keep the breast from drying out. This recipe works well with packaged whole chicken breast or leg quarters, just cut cooking time in half (no foil).